Yet another Auggie has joined the ranks of those working and studying across the Pacific. Joyce Pfaff, associate professor of physical education at Augsburg, and her husband, Doug, make up the Augsburg Asia delegation with Ashley Stoffers and Nou Chang in South Korea, and Marissa Machado, international admissions counselor who is currently recruiting in Vietnam and China. On September 2, the Pfaffs traveled to teach at United International College in Zhuhai, China for four months. Pfaff is maintaining a blog about their experiences. The Pfaffs have been exploring the city and areas around Zhuhai. 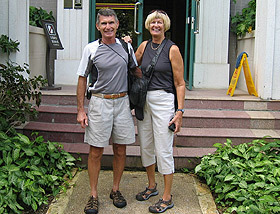 Those who know Joyce will not be surprised to learn that she and her husband are staying very active, biking around the city and hiking with a fellow Minnesotan (carrying sticks to fend off the monkeys) outside of Hong Kong. Yesterday we ventured out to purchase new bicycles. We decided we could not live here for 4 months without wheels, so we made the big splurge. It cost us less than $100 for both of them. We had plenty of help and ended up with 2 very nice, brand new, single speed, fully loaded (basket, bell, lock and kickstand) bikes that have got to weigh 50 pounds each. We went for a 2-hour ride today and both agree that without our bikes we would never be able to see and explore many of the things our new home city of Zhuhai has to offer. In an Oct. 12 message to her colleagues, Joyce wrote, “We begin our second week of classes today. We (Doug is my teaching assistant) have 2 Fitness classes. When I introduced Doug as my TA and also my husband all of the students laughed, so at least they understood some of what I was saying. I am working on talking slowly (not easy for me), repeating myself and using very simple terms that are easy to understand. I realized early on that I could not use words like “abdominal muscles” and need to say “stomach” instead. The students were listening very intensely but not understanding me. UIC (United International College) is a 4-year liberal arts college founded jointly by Bejing Normal University and Hong Kong Baptist University. It is located in Zhuhai, China (just East of Hong Kong and North of Macau). All classes are taught in English. The school begins its fourth year in the fall of 2008 and will have approximately 3,300 students enrolled. This fall 1,200 new first-year students are expected, and they will be graduating their first class of 270 students in the spring of 2009. At present, the majority of students come from mainland China, but the intention is to recruit more international students to realize a goal of about 50/50 (international/Chinese). The student body is approximately 60% female and 40% male. Although UIC has 13 different majors, 50% of the students are majoring in business.